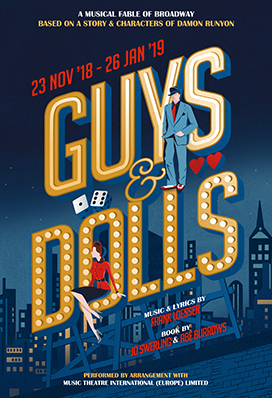 After an extremely busy Christmas period, one production that stood out amongst those we supplied the amazing production of Guys and Dolls which played from November through until February at The Mill At Sonning Theatre. For the main FOH we provided two hangs of 3x L-Acoustics KIVA II, which, working closely with sound designer Nico Menghini, we felt was the best solution to cover the steep seating banks whilst remaining as unobtrusive as possible. We also used L-Acoustic X8s as out-fill and monitors and 5XTs as delays and surrounds. Guys & Doll’s is a very traditional musical and therefore we used DPA 4061 hairline mics to avoid seeing any microphones so it would look as natural as possible. The band of 7 was mic’d using an entire DPA microhone system, to remain as discreet as possible. Aviom D800 and A360’s were utilised as a personal mixing system for the band. A Yamaha CL5 and RIO system will be supplied as a control solution. The space its self does not leave much room for subwoofers, So working with the set designer Diego Pitarch, we found a way to build 2x L-Acoustics SB18 into the set design so that they wouldn’t be noticed by the audience.